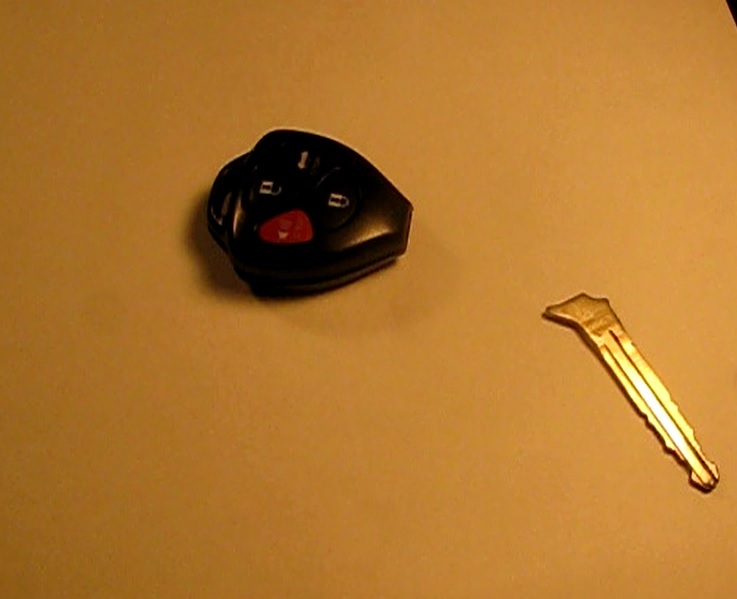 I was surprised when a family member handed me a two piece remote access chip-type ignition key. I knew this key would cost $350 to replace so I was going to do all I could to put it back together again. This is a Toyota key. The plastic holder of the metal key had broken apart and separated. I was amazed at how little of the cut, metal portion of this key actually overlapped with the plastic part. My first thought was that this could be simply snapped together again. Just slip it back into the broken slot. Good enough....right? I tried to fix this with minimum effort. The metal top of the key snapped very snugly into the plastic holder. Then the back cover snapped over that and made a quite tight fit. Surely this would hold together. On the second or third ignition turn it came apart. I should have glued the broken seam back together. Yeah, that's why it came apart again. So I got out some used super glue, snapped the key back in the slot and glued the seam. I clamped it together and let it dry awhile. I have seen super glue hold broken parts together many times. This time it held for about 3 days before I had the two pieces back in my hand again. I figured it out. I didn't apply glue on enough of the surfaces of the key. Surely more glue was all that was needed. I bought a fresh pack of glue. That old glue maybe wasn't good anymore. I glued it and clamped it for the last time. This time jut two turns of the ignition put it back in my workshop. 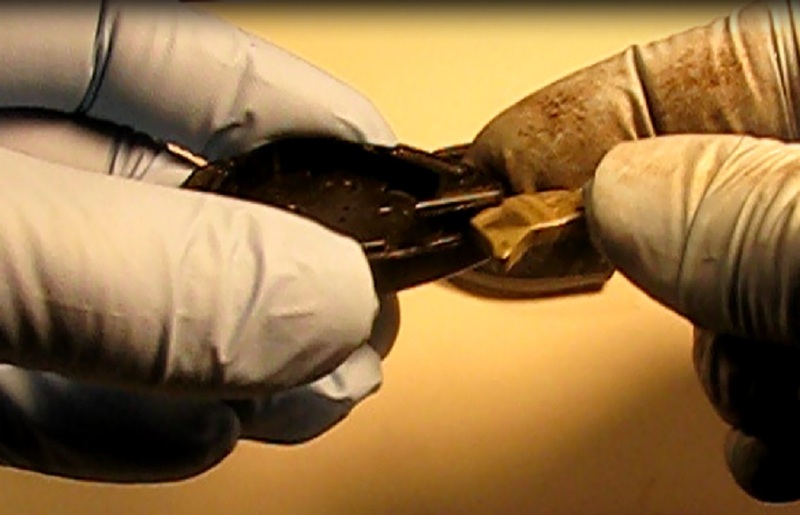 1) Insert the metal portion back into the plastic holder and reassemble the key. 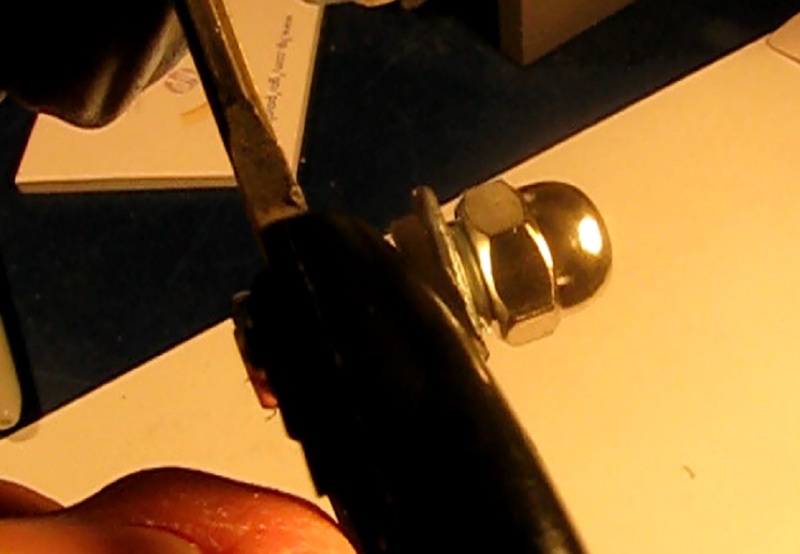 2) Carefully center punch the plastic back of the key. I used a spring-loaded punch to help center the hole in the plastic portion. Then I drilled through the back plastic part. 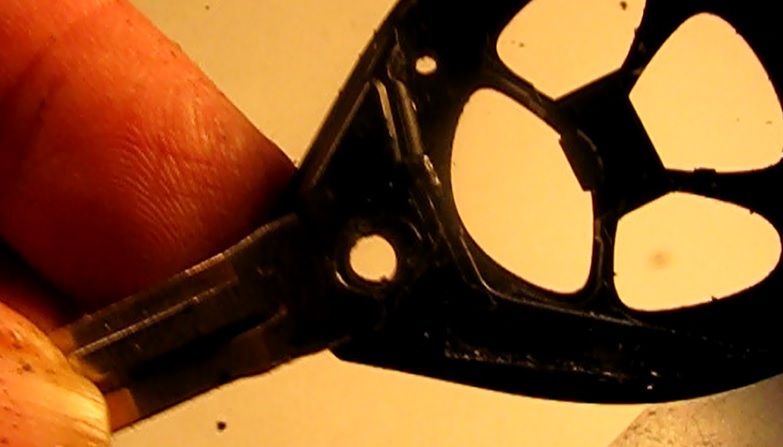 3) Remove the metal portion from the assembly. 4) Drill through the rest of the plastic. 5) Drill the metal part of the key. This is the tough part. The drill bit left a mark on the metal portion of the key. I punched that and used a sharp drill bit to drill a precise hole. I used a 9/64" drill bit for the hole. The #6 screw would be a close fit. 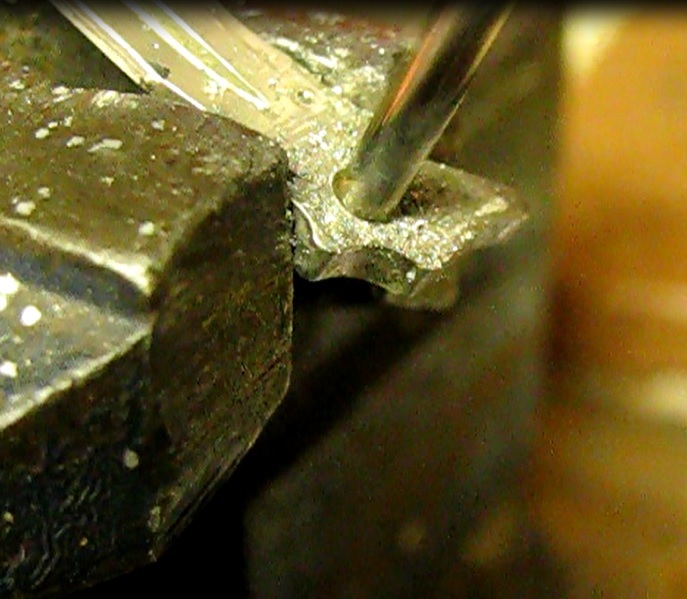 6) Re-assemble the whole key and check for good alignment on the hole. Make sure the screw goes through the hole cleanly. If not remove material from either part to make it fit. Test fit the hardware.I would have to flatten the head of the screw on a bench grinder and grind out the under surface of the back of the key to make the cover snap over it. 7) Measure the length needed for the screw. I was using an acorn (or "cap") type nut so I had to be sure the length was right so it would not bottom out when tightened. Also account for plain and lock washers. In this case the nut would have to tighten against a sloping surface. I had to taper the washers on a grinder to make it sit flat and hold. 8) Cut the screw to length. I placed a nut with a back-up nut at the cut-off point. Then I put it in a vice and cut it off cleanly with a cut-off wheel on a Dremel Tool. 9) Assemble the key with the hardware fix. locksmith to come to your rescue at any time of day or night. Whether your locksmith emergency is due to lost car keys, lost house keys, or burglary damage repair, you can rely on flatratelocknkey-denver Locksmith Pros for all your emergency locksmith issues. Our team of mobile locksmiths are on call 24/7 and will come to your location in a 30 minute response time with all the tools and equipment needed to solve your problem. It is a great way to repair broken chip type ignition, I have learn a lot from your post, It is an impossible way but try and try It is possible. Find the best service place for car key remote replacement for your car. These shamefull auto manufacturers whom are guilty of building unsafe vehicles and deadly airbags,etc etc! Then they go and make sure this crap is built to break forcing hard working folks to shell out a fortune to their "STEALERSHIPS" for something so stupid as damn replacement key!! !